Price action patterns,On which we see different behavior of market price reflection of buying and selling pressure. If there is one price action pattern which is the most deadly combination of losing money and greed, then it has to be “Event spike”Before moving further I would like to show that this article is about fading certain price movements which can cause you a lot of losses .In other words, as with trading, “Penny saved is penny earned”. 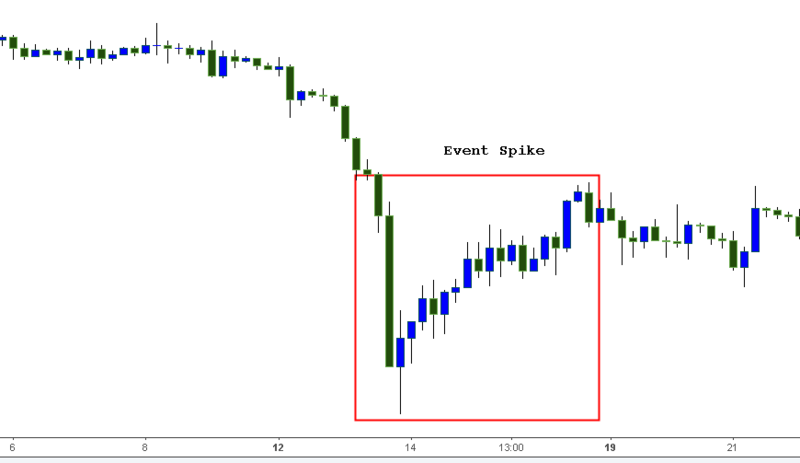 What is an “Event spike”? A large parabolic movement which follows an event such as earnings announcement, Economic reports etc are called “Event spike”. This move is all about feeding frenzy or herd behavior of market participants are influenced by price moment itself! Some people even refer to this as price reflexive. How does the price action patterns look like? No! Not at all, We can’t trade movements like this if you are a “technical trader”. But for a price action patterns trader it is possible! Simple rule is to keep an eye on “price sensitive” announcements or fundamental reports that are important for market participants. Also make sure that technical signals during these times should be avoided so that you won’t fall in the trap and lose money. Fade the first move after an announcement or economic reports, it doesn’t matter what signals you get from an indicator or your method, these are movements where we need to protect the funds. Also avoid placing any trades before an event and close existing positions if any.